Punter Southall Governance Services Limited (we, us or our) know that you care how your information is used and shared and we appreciate your trust in us to do that carefully and sensibly. Your privacy is important to us and we are committed to protecting and respecting your privacy. The specific types of personal information we may collect and use about you will depend upon your use of our website facilities, services or products, how you use them and the information you choose to provide. Required fields on our online forms are your name, job title, organisation name and your email address. Your telephone number and address are not required. If you do not fill in the required fields you will not be able to submit the form. Opening of emails, date and time email opened, links clicked on in email We and our website service provider (a data processor that works on our behalf), may use a variety of technologies, including cookies and similar technologies, to assist in collecting this information, as is discussed below. We may aggregate and/or anonymise any personal information collected through the facilities, services or products offered so that such information can no longer be linked to you or your device. We may use this information for any purpose and may share this data with our third parties. Please note we need certain types of information so that we can provide the website facilities, services and products to you. If you do not provide us with such information, you may no longer be able to access or use our services or products. From Pension Funds Online we also obtain details regarding your pension scheme including scheme type, size (membership and assets) and adviser names. Where you make an enquiry, ask a question or request information on a service or product, download content of value from our website, inform us of your marketing communication or report a problem we will require your consent or rely on other lawful bases of processing such as legitimate interest, performance of a contract or compliance with legal obligations, before we use your information. Where you have requested a service or product, the use of your information is usually necessary for the fulfilment of the agreement we’ve entered into with you for the provision of those services or products. Where we provide you with the website facilities (including content of value downloads and research), services or products you’ve requested, use of your information is necessary to perform our obligations in fulfilling your request. Where we collect your information automatically or you respond to a survey, we use your information for our legitimate business interests. This is to provide security for our website, operate our business and provide our services and products, ensure safe environments for our staff and visitors to our offices, comply with legal requirements and defend our legal rights, prevent fraud and to know you, our customer, to whom we are providing the facilities, services or products. Where we have obtained your data from a third party, we will process that data on a legitimate interest basis. We always aim to provide only tailored information concerning a legitimate business interest. It is not intended that your information be transferred outside the European Economic Area (EEA) but, if it is, Model Clauses or other mechanisms approved by the European Commission will be put in place prior to us processing your information. Where required we will also obtain your consent. You can obtain also further information regarding the mechanisms used to safeguard your data by contacting our team or Data Protection Officer at the contact details listed above. When we collect information automatically, as stated above, we and our service providers use internet server logs, cookies, tags, SDKs, tracking pixels and other similar tracking technologies. We use these technologies in order to offer you a more tailored experience in the future by understanding and remembering your particular browsing preferences and understanding how visitors are using our site. We also use them to help develop our products, services and business. For more information on the cookies we use, the purposes for which we use them and how you can control them please refer to our cookies policy . You have choices when it comes to receiving marketing communications and taking part in market research. We will send you relevant news about our opinions, products and services in a number of ways including by email. We always aim to tailor the information we send to each individual to make it as relevant and useful as possible. When you make an enquiry, register for an event or download content of value via our website, we will direct you to a preference centre where you can tell us what types of information you’d like to receive (or opt out completely). You can change your marketing choices at any time online, over the phone or in writing. We would also like to hear your views to help us understand the environment we are working on and improve our services and products, so we may contact you for research purposes. You always have the choice about whether to take part in our any of our surveys. Our website may provide links to other third party web sites. Even if the third party is affiliated with us through a business partnership or otherwise, we are not responsible for the privacy policies or practices or the content of such external links. These links are provided to you for convenience purposes only and you access them at your own risk. Right to be informed: you should be given, at the time your information is collected, or can ask for information about how your information is collected and used. Right of access: you can ask for copies of all the information that we process about you. Right to rectification: you can ask to have inaccurate information held about you corrected. Right to erasure: you can ask for the information held about you to be erased (subject to certain criteria). Right to restriction of processing: you can ask us to stop processing your information (under certain circumstances). Right to data portability: you can, under certain circumstances, request that we transmit your personal information to another provider of services. Right to object: you can object to your information being processed if our legal basis for processing your information is based on legitimate interests. 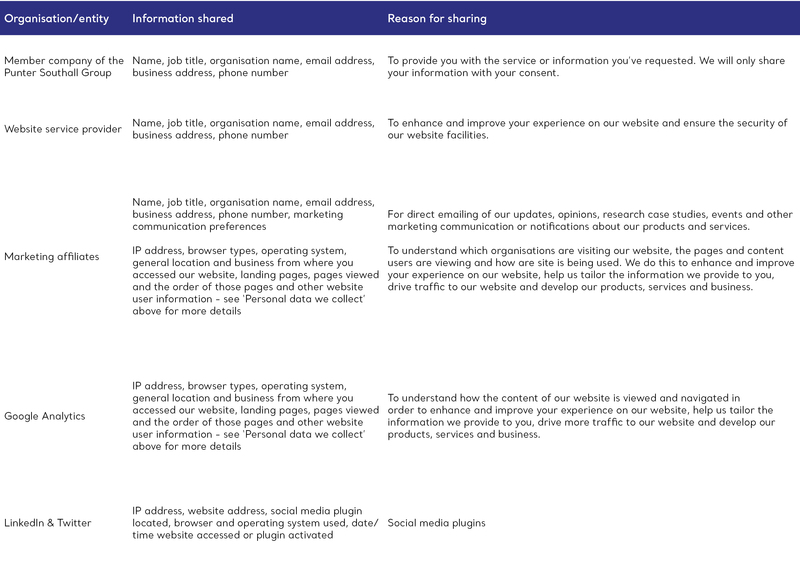 To check whether we use your information for legitimate interests see the section ‘Why we collect and use your personal data’. You also have the right to object to object to direct marketing if you make such an objection, we will cease to process your personal information for this purpose. If you would like to exercise any of your rights mentioned above, you can do so by writing or emailing our Data Protection Officer or the PSGS team at the address detailed above. By changing your marketing preferences or unsubscribing to our marketing emails. In writing, to our team or Data Protection Office. Please note: Opting out will not affect the lawfulness of processing prior to your opt-out. You will be informed of changes to this policy by dedicated service emails or by notification on our website.